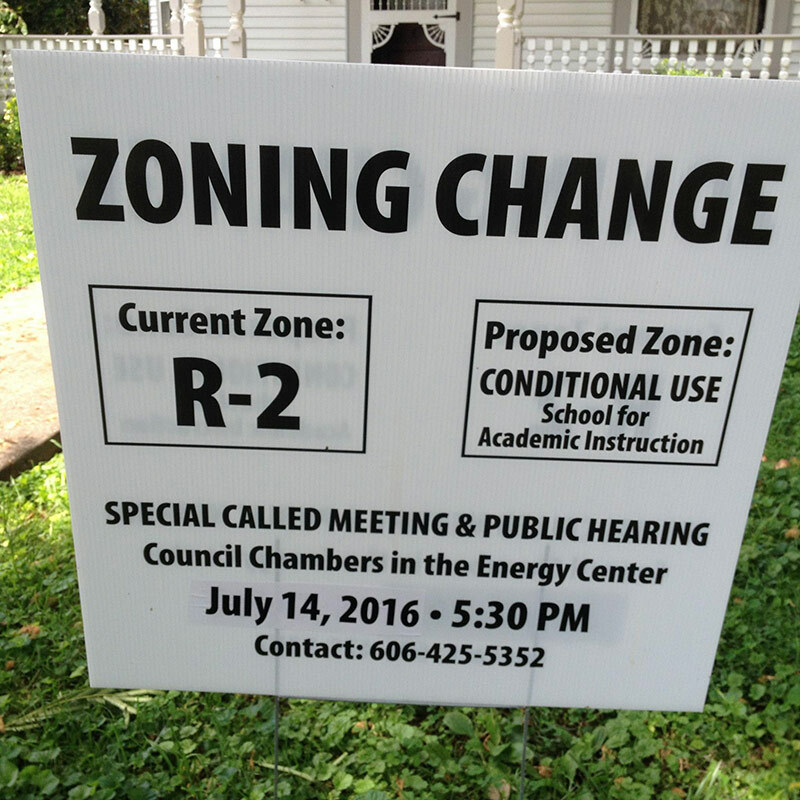 Conditional zoning or rezoning allows a change in zoning activities subject to certain conditions. They must be designed to protect adjacent land from the loss of use value, and the restrictions that are imposed are not usually applicable to similarly zoned property. Rezoning conditions are a discretionary process that provide a key opportunity to impose conditions that may not be possible otherwise. It allows general plan policies to be translated into conditions of rezoning that allow a change in zoning activities. These can include higher density, demonstration of lower water use than current use, and Covenants, Conditions and Restrictions that require Xeriscape and other water conservation features, or prohibit golf courses and other water intensive uses. Conditional zoning is becoming increasingly popular because it allows zoning to be tailored to particular situations. Conditional zoning can be implemented using an adopted policy or through a development agreement during the rezoning process to include water-conserving measures, such as on-site recycled water use and water-conserving landscaping. These agreements can also include detailed water conserving design and infrastructure features. Rezoning can be extremely valuable for the landowner, providing more density and profit than the existing zoning. Individual parcel rezoning must be done in conformance with the comprehensive plan to reduce the chance that it will be challenged as spot zoning. Local governments may also use special use permits to further water conservation. This can be done by allowing water-conserving land uses “as-of-right”, or permitted, designating them as conditional uses subject to planning commission review and conditions to ensure they are appropriate in the neighborhood. Alternatively, special use permits can be used to restrict water-intensive uses, requiring an examination of the use’s impact before approval and imposing conditions to reduce the impact. For example, a town could classify greenhouses and nurseries operated as retail businesses as conditionally permitted uses, meaning they would be reviewed and must receive a conditional use permit. This allows the town both to examine the impact of the use and to place restrictions on its operation. Civano is a sustainable master planned community in southeast Tucson. Sustainable planning principles were incorporated into its design, including water conservation technologies. It is a mixed-use development with mixed-housing residential, retail uses, community facilities, and open space. The Civano development evolved from a public/private collaboration interested in providing a model for sustainable development. Originally envisioned as a model “Solar Village,” the State Land Department dedicated the land for the project. The City of Tucson approved the Civano Master Plan as a condition of rezoning, and the conditions were broadened beyond solar to include additional sustainability goals and requirements, including that potable water use be reduced by 65 percent compared to traditional development. 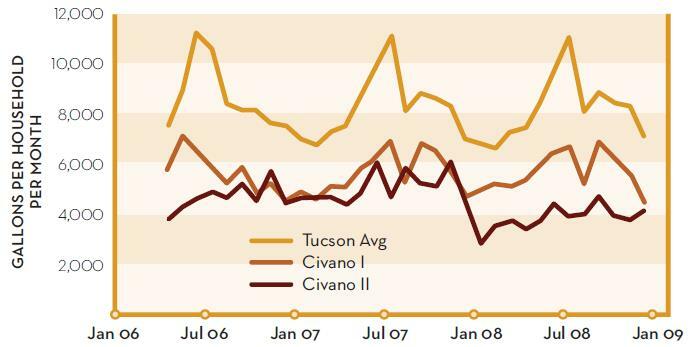 Chart showing lowered water demand at the Civano development in Tucson, Arizona. Photo credit: Western Resource Advocates. The City later adopted an “Integrated Method of Performance and Cost Tracking” (IMPACT) System for sustainable development that set standards and performance targets to help achieve the conditions established in the rezoning approval. These conditions included reducing interior residential potable water use to 53 gallons per person per day and reducing interior non-residential potable water use to 15 gallons per employee per day. The conditions also required establishment of an exterior residential water budget of 28 gallons of water per person per day and discouraged construction of private swimming pools. Other conservation requirements limited residential site clearing to preserve native vegetation and maximize natural drainage, required Xeriscape landscaping, and prohibited potable water use for landscape irrigation. The Community of Civano Joint Venture purchased the property in 1996 with support from the City and private sustainable development funders. The City entered into a memorandum of understanding (MOU) with the developer to guarantee that the standards and performance targets would be met. IMPACT Reports are regularly prepared to document success in meeting targets, but the developer can propose changes to the MOU if there are more effective ways to achieve them. For example, Civano II homes are not required to use recycled water outdoors because it was found not to be cost-effective to install and maintain systems given the low volume of outdoor water use. By incorporating sustainability goals into the rezoning approval process and developing an IMPACT System to ensure the standards and performance targets are implementable and measurable, the community uses much less water compared to the rest of Tucson and is much less vulnerable to drought due to its low water use and its relatively low requirement for potable water. Water demand at Civano is 40-50% lower during the summer and 20% lower during the winter compared to the average Tucson water customer. The Civano IMPACT System MOU can be found here. The Civano Master Planned Area Development can be found here. “Zoning-In” Water Conservation can be found here.